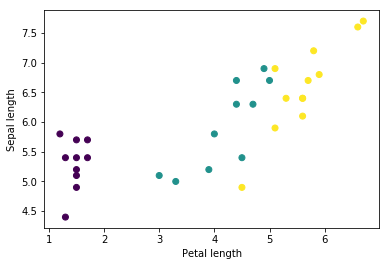 This guide introduces Swift for TensorFlow by building a machine learning model that categorizes iris flowers by species. It uses Swift for TensorFlow to: 1. Build a model, 2. Train this model on example data, and 3. Use the model to make predictions about unknown data. Import data with the Datasets API. Build models using Swift abstractions. Use Python libraries using Swift's Python interoperability when pure Swift libraries are not available. Import TensorFlow and some useful Python modules. // in the dataset API. Download the dataset file and convert it into a structure that can be used by this Swift program. Download the training dataset file from http://download.tensorflow.org/data/iris_training.csv. We use a Python library to demonstrate Swift's Python interoperability. Swift's Python interoperability makes it easy and natural to import and use Python libraries from Swift code. This dataset, iris_training.csv, is a plain text file that stores tabular data formatted as comma-separated values (CSV). Let's look a the first 5 entries. Swift for TensorFlow's Dataset API is a high-level API for reading data and transforming it into a form used for training. Eventually, the Dataset API will be able to load data from many file formats. The Dataset API is currently very incomplete, so we include some glue code from "TutorialDatasetCSVAPI.swift" that helps the Dataset API load data from the CSV file into the IrisBatch struct. /// A batch of examples from the iris dataset. /// [batchSize, featureCount] tensor of features. /// [batchSize] tensor of labels. The Dataset<IrisBatch> is a sequence of IrisBatches. Let's look at the first element of the dataset. Notice that the features for the first batchSize examples are grouped together (or batched) into firstTrainFeatures, and that the labels for the first batchSize examples are batched into firstTrainLabels. The Swift for TensorFlow Deep Learning Library defines primitive layers and conventions for wiring them together, which makes it easy to build models and experiment. A model is a struct that conforms to Layer, which means that it defines an applied(to:in:) method that maps input Tensors to output Tensors. The applied(to:in:) method often simply sequences the input through sublayers. Let's define an IrisModel that sequences the input through three Dense sublayers. // Apply the model to a batch of features. Taking the argmax across classes gives us the predicted class index. But, the model hasn't been trained yet, so these aren't good predictions. Our model will calculate its loss using the softmaxCrossEntropy(logits:labels:) function which takes the model's class probability predictions and the desired label, and returns the average loss across the examples. Swift for TensorFlow has many optimization algorithms available for training. This model uses the SGD optimizer that implements the stochastic gradient descent (SGD) algorithm. 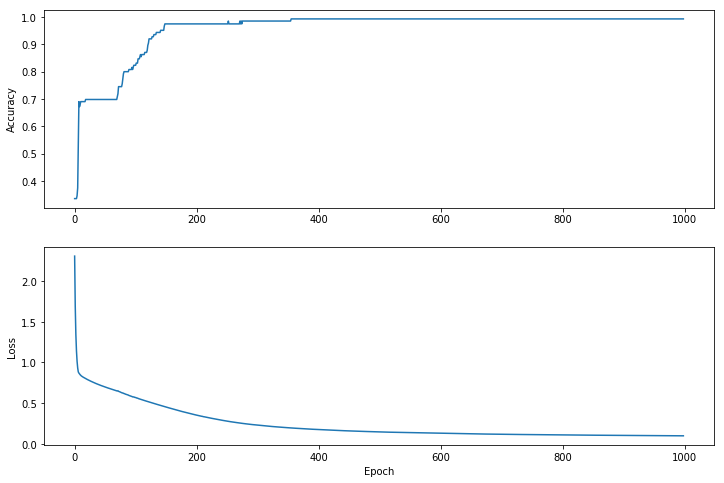 The learningRate sets the step size to take for each iteration down the hill. This is a hyperparameter that you'll commonly adjust to achieve better results. Use gradient descent to update the model's variables. The epochCount variable is the number of times to loop over the dataset collection. Counter-intuitively, training a model longer does not guarantee a better model. epochCount is a hyperparameter that you can tune. Choosing the right number usually requires both experience and experimentation. While it's helpful to print out the model's training progress, it's often more helpful to see this progress. We can create basic charts using Python's matplotlib module. Note that the y-axes of the graphs are not zero-based. // NOTE: With `batchSize = 32` and 30 examples in the test dataset, only one batch will run in the loop. We've trained a model and demonstrated that it's good—but not perfect—at classifying iris species. Now let's use the trained model to make some predictions on unlabeled examples; that is, on examples that contain features but not a label.